To meet the growing demands for a Russian Language Bible program we have developed "Russian Electronic Bible" project, Slavic Bible for Windows is now a reality! Product work on IBM PCs only from 386 and more with any Windows system (3.1, 95, 98, Me, NT, 2000), English or Russian version. 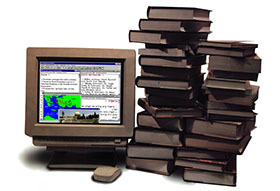 Now this program has Bible texts in Russian (several editions), Ukrainian (several editions), Belorussian, Georgian, Armenian, Church-Slavonic, Biblical Hebrew (OT), Greek (LXX & NT 4 editions), Latin, Coptic, Syraic and 16 European languages. Russian and English texts have cross reference modules that can be modified with your own cross references. Personnel notes can be attached to any passage of the Bible. Word translation is just a right mouse click away thanks to Russian-English, English-Russian, Greek-English-Russian or Bible dictionaries. Product has a two-language (Russian & English) interface now. User can change the interface language "on the fly" without restarting the Slavic Bible or Windows. Product has a two-language (Russian & English) interface now. User can change the interface language "on the fly" without restarting the Slavic Bible or Windows. First translation of New Testament in the Russian language. Russian Bible Society, 1824. Four Gospels, Acts of apostles. "Pearl of Carpathian" translation. The New Testament in Russian, "Recovery Version"
Central Asian translation of Scriptures in Russian new! Bible in Ukrainian (Khomenko translation) new! Bible in Ukrainian (Turkoniak translation from LXX) new! New Testament in Ukrainian, F. S. Morachevsky translation new! Septuagint (Old Testaments in Greek) with morphological parse new! The English version of the Septuagint. Translated by Sir Lancelot C.L. Brenton and published by Samuel Bagster & Sons, Ltd. London 1851. new! West Saxon Gospels of XII century new! Bible in German (Luther Bibel) in original spelling of 1545 edition new! "Slavic Bible" 1.5 for Windows is freeware. You can download it free or receive on CD-ROM for mail sum only. Tou can copy and install this software free in any computer. Please tell me how much the mail sum is for you to send me the CD-ROM. or instructions how to download it.